This studio arranged photo shows two specimens found among litter on the forest floor. The millipede (family Julidae) might be a Leptoiulus proximus, but there are several similar species here in Norway. 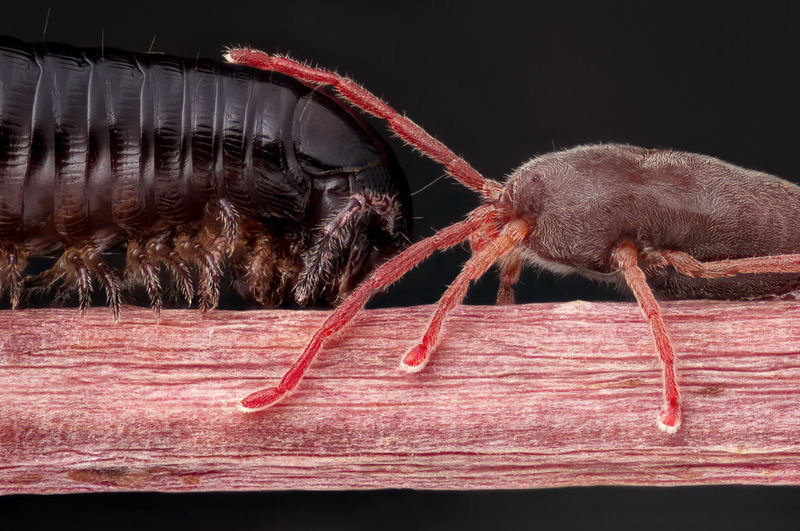 The mite is probably of the family Erythraeidae. The twig is the stem of a maple leaf. The photo itself is a 2x2 mosaic of individually stacked images, stitched together with Hugin, resulting in a 55Mpix image. Equipment: Canon 7D, Nikon BD Plan 5x objective, 30um stepping. Light is dual flash through paper. Stacking with Zerene PMax (406 images in total). I presume the subject stage moved in the x and y dimensions to make the matrix panorama. Can you describe or post a photo of your subject stage? Yes, the subject stage is moved in x/y direction. 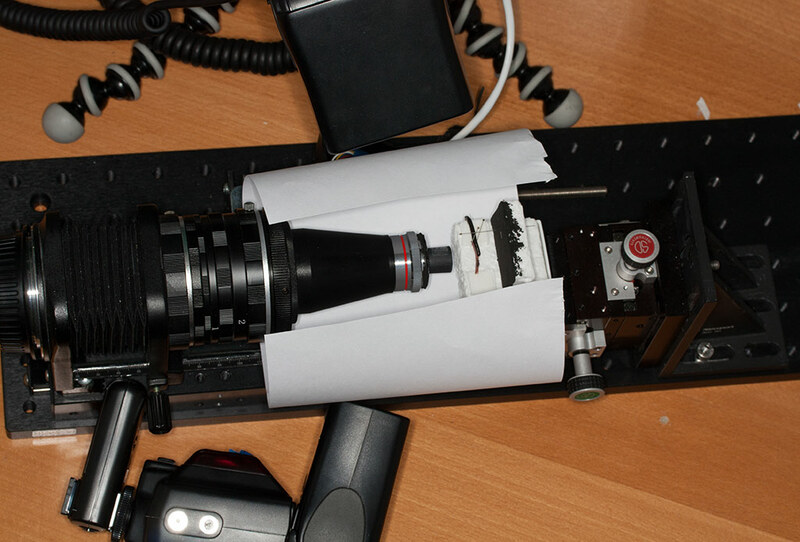 I do this manually using a SD Instruments XY stage, vertically mounted. The paper diffuser is opened up here to reveal the subject (millipede can be seen supported by a few needles). Beneath the subject platform but not visible is a rotation stage and a dual axis goniometer, connecting the subject stage to the XY stage. Thanks for the photo. Classy subject rig! Is the subject on a block of styrofoam? If so, doesn't the styrofoam wiggle around from vibrations? I like this image, too! No surprise that it took a lot of "patience and fiddling"--but the results are worth it. May I raise a trifling point for clarity? As the "x," "y," and "z" axes are most commonly labeled in opto-mechanical systems, the up-down axis is designated "z." By this convention, when the "XY stage" is mounted vertically as shown, it would be said to provide movement along the x and z axes of translation, not the x and y axes. So following this custom, one might way, "The subject stage is moved along the x and z axes, by means of a vertically-mounted SD Instruments XY translation stage." It's a minor point of labeling, but it gave me momentary confusion. 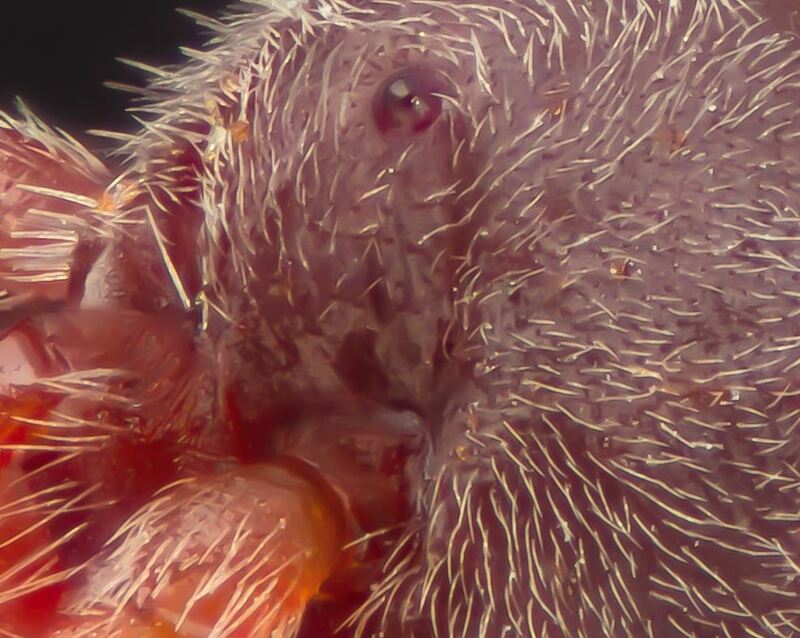 When I saw the picture of the millipede and mite on the stem, I envisioned its having been made on a horizontal rig, with stacking movement along the y axis and stitching movement along x and z axes. When Bill asked if the stitching movement had been performed "in the x and y dimensions," I interpreted this as "along the x and y translational axes," and thought, "no way." This would require a vertical rig--under which this posing would, I think, have been even more difficult than it was in front of a horizontal rig. Then, upon see a "yes" answer, my brain went "What?????" In retrospect, I think I should have interpreted Bill's "x and y dimensions" as "the x and y dimensions of the photograph," or more formally, "the x and y axes in a two-dimensional coordinate system." But since here we're talking about movement of a subject stage, which can occur in three dimensions, my brain reached for the conventions of the three-dimensional coordinate system most familiar to me (and perhaps others who have been pouring over opto-mechanics catalogs too long). In defense of geddy's labeling, it's very common for stacking systems to call the focus-stepping direction "z" regardless of how it happens to be oriented with respect to gravity. This avoids the chaos that would otherwise occur when a StackShot happens to be horizontal at one moment, vertical at a second, and oblique at a third. The situation is similar for the common term "depth map", which always means distance along the focus-stepping axis again independent of gravity. Bill: yes, i do use styrofoam. The platform itself has a U-shaped plastic holder that i can press the styrofoam into, so the styrofoam sits nice and tight. Styrofoam works very well with insect needles, and i just cut out a new piece when the styrfofoam gets worn. Another good thing about styrofoam is that the surface is matte, neutral white, so it scatters light perfectly. When it comes to axis labeling, I am totally non-compliant. . . .
Well Geir, you showed us a picture of your rig, and that makes things clearer, regardless of labeling. Lots of folks study the rigs showcased here at PMN, and derive their own designs from them. Fostering a clear understanding of the six axes of translation and rotation, and how these axes are typically referred to by manufactures, engineers, and fabricators, may be very helpful to these folks, and perhaps save them time and money. Ideal macro rigs address all six axes of translation and rotation (yours seems to). The very best may address some axes in multiple ways with differing amounts of travel and resolution. So design and discussion of advanced macro equipment is heavily dependent on clear and efficient discussion of axes. My rig is horizontal; eventually, I'll add vertical capability. When I say to my fabricator, "Don, I want to use this Velmex stage as a rough z-axis positioner, with the Nikon focus block mounted on it for coarse and fine z-axis adjustment, and you'll notice that it has a stepper motor on it for automated z-axis stepping movement," he'll understand instantly. But if I had used the same phrasing when working with him to build my current horizontal (which uses these same components for the x-axis), he'd have a right to be befuddled. Don is wise and would immediately sense a miscommunication, so after some talking, he'd know that I really wanted a horizontal rig, and would substitute "x" for "z" before construction. But I could easily see another fabricator, not so wise, simply building what the customer requested. But back to the original subject--your stack and stich image is really cool! Thanks for sharing it (and your rig). Hm, I'm confused now... I've been putting together some webpages about stacking and throughout all the research the convention very much seems to be to call the stepping axis the Z axis?! I maybe wrong but I believe that the axis are always from the camera's point of view... ie Z being forward and back with respect to the camera. Plenty of opportunity for misdescription though - on a vertical rig Z actually becomes up and down movement relative to gravity whereas on a horizontal rig it's just forward and back. But they're both still Z. It's a bit like yaw, pitch and roll on a plane. Angle to gravity is insignificant, it's from the plane's point of view. Slap me if this is incorrect. It's a bit like yaw, pitch and roll on a plane. But there's one important difference: it's pretty safe to assume that a reader will understand yaw, pitch, and roll the same way you do, and that's not true for X, Y, and Z. In other words (pun intended), yaw pitch and roll have only one meaning with respect to vehicles, but X Y and Z have multiple meanings with respect to mechanical equipment in general. When you're writing, just be aware that some readers you care about may understand "Z" to mean something different, so you should make very clear what it means in your context. Gee, what a can of worms I opened with my question about "x,y"! would refer to the camera's (image's) "x,y". Must admit that I have strident reactions against elements of both Bill and Johan's posts in this thread, and consider some of their ideas to be significant steps backward that will hurt hardware design advancement. That said, I hold deep respect for each of the these gentlemen's intellects, and hope I may continue to enjoy their friendships, even as we may disagree on pertinent issues. We've raised a vital issue, here--an issue that perhaps I've spent spent more time comtemplating than most--and for the clarity of PMN discussion, think it ought to be dealt with thoroughly and seriously. On the other hand, it seems unfair to derail onto such a tangent this thread of Geir's on his impressive images. This evening, I've been preparing materials to use in addressing the axial issues in a separate thread. I still have work to do on them, but when ready to post, I propose to do so in a new thread. I would welcome the opinions of Geddy (the OP), the adminstrators, and other interested parties on the most useful way to do this. I'm not sure what sort of guidance you're looking for. As you suggest, a new thread seems appropriate. I'm not sure whether Technical Discussions or Equipment Discussions would be better -- probably there's no big difference. Eventually the material might morph into a FAQ, but that's clearly a matter for the future given the current lack of consensus. I eagerly await Chris's thread on this subject with an open mind, and of course would never let wrangling over nomenclature affect frabjous feelings of friendship. time, and no one sat down like Chris is doing to try to ensure sensible nomenclature. Harvard granted its first Ph.D. in 1990). Freshmen are taught that the note "C" is also called "B-sharp" or "D-double-flat". Music theorists simplify this by referring to "C" as "pitch class 0". That being said, and hoping this is not a "significant step backwards", let me propose a possible term: "camera-x" (but what if the camera is in portrait orientation? Perhaps "image-x"?). Consensus would be good! Seriously I can only speak for my own experience which is having the stacks referred to as going through the Z axis (even z stacking') but maybe you're aware of stuff I'm not Chris, go for it . No sarcasm intended at all and I'm really not jumping through hoops. Agreeing to disagree without recrimination is what normal people do, no? .